International Day of the Girl Child is an international observance day declared by the United Nations; it is also called the Day of the Girl and the International Day of the Girl. October 11, 2012, was the first Day of the Girl. The observation supports more opportunity for girls and increases awareness of gender inequality faced by girls worldwide based upon their gender. This inequality includes areas such as right to education/access to education, nutrition, legal rights, medical care, and protection from discrimination, violence against women and unfree child marriage. The celebration of the day also "reflects the successful emergence of girls and young women as a distinct cohort in development policy, programming, campaigning and research." International Day of the Girl Child increases awareness of many issues and inequalities faced by girls around the world. Many global development plans do not include or consider girls, and their issues and problems become "invisible." More than 62 million girls around the world have no access to education. Worldwide and collectively, girls ages 5 to 14 spend more than 160 million hours more on household chores than boys of the same age do. Globally, one in four girls are married before age 18. On October 11, 2016, Emma Watson, who is also the United Nations Women's Goodwill Ambassador, urged countries and families worldwide to end child marriage. Many girls around the world are vulnerable to acts of sexual violence and the perpetrators often go unpunished. The Day of the Girl helps raise awareness not only of the issues that girls face, but also what is likely to happen when those problems are solved. For example, educating girls helps reduce the rate of child marriage, disease and helps strengthen the economy by helping girls have access to higher paying jobs. Girls at a 2014 International Day of the Girl Child Event. The International Day of the Girl Child initiative began as a project of Plan International, a non-governmental organization that operates worldwide. The idea for an international day of observance and celebration grew out of Plan International's Because I Am a Girl campaign, which raises awareness of the importance of nurturing girls globally and in developing countries in particular. Plan International representatives in Canada approached the Canadian federal government to seek to the coalition of supporters raised awareness of the initiative internationally. Eventually, Plan International urged the United Nations to become involved. Each year's Day of the Girl has a theme; the first was "ending child marriage", the second, in 2013, was "innovating for girl's education", the third, in 2014, was "Empowering Adolescent Girls: Ending the Cycle of Violence." and the fourth, in 2015 was "The Power of Adolescent Girl: Vision for 2030". The 2016 theme is "Girls' Progress = Goals' Progress: What Counts for Girls." By 2013, worldwide, there were around 2,043 events for Day of the Girl. 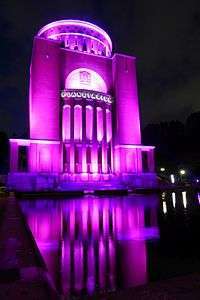 Buildings (here the Planetarium Hamburg) are illuminated in the color pink by Plan International to draw attention to the interests of girls worldwide. Various events to promote the Day of the Girl are planned in several countries. Some are sponsored by the United Nations, such as a concert in Mumbai, India. Non-governmental organizations, such as the Girl Guides Australia, are supporting events and activities for International Day of the Girl Child. Local organizations have developed their own events, such as Girls and Football South Africa, who will distribute T-shirts on International Day of the Girl Child to commemorate the 1956 Black Sash march by 20,000 women. An all-day event was held on London's South Bank in 2013, which included theatre and film performances produced by Body Gossip, an organisation that campaigns on body image and mental health issues. For the first Day of the Girl, a virtual event was developed by Sage Girl and iTwixie to bring thousands of individuals and organizations together online. Social media uses the hashtag, #dayofthegirl to track events and news about the day. ↑ "As Malala Recovers, U.N. Marks International Day of the Girl Child". Los Angeles Times. 11 October 2012. Retrieved 11 October 2016. ↑ Hendricks, Sarah; Bachan, Keshet (2015). "Because I Am a Girl: The Emergence of Girls in Development". In Baksh, Rawwida; Harcourt, Wendy. The Oxford Handbook of Transnational Feminist Movements. Oxford University Press. p. 895. ISBN 9780199943494. ↑ "World Gears for First Ever 'International Day of the Girl Child'". Al Arabiya. 6 October 2012. Retrieved 11 October 2016. ↑ Bailey, Chelsea (11 October 2016). "Michelle Obama Calls for 'Soldiers' in Fight for Girls Education". NBC News. Retrieved 11 October 2016. 1 2 Haynes, Suyin (11 October 2016). "What to Know About the UN's International Day of the Girl". Motto. TIME. Retrieved 11 October 2016. ↑ Ford, Liz (11 October 2016). "How Are You Marking International Day of the Girl? Share Your Stories". The Guardian. Retrieved 11 October 2016. ↑ Beck, Christina (11 October 2016). "Emma Watson's Powerful Words on International Day of the Girl". The Christian Science Monitor. Retrieved 11 October 2016. ↑ Picq, Manuela (11 October 2012). "A Much Needed International Day of the Girl". Al Jazeera. Retrieved 11 October 2016. ↑ Krache, Donna (11 October 2012). "Education a Focus on International Day of the Girl Child". CNN. Retrieved 11 October 2016. ↑ Crittenden, Camille (8 October 2012). "International Day of the Girl: Why Science & Math Programs Matter". The Huffington Post. Retrieved 11 October 2016. ↑ "Challenge Accepted! Canadian leaders to give up their seats to acknowledge that 'Girls Belong Here' on International Day of the Girl". Canada Newswire. 28 September 2016. Retrieved 11 October 2016 – via EBSCOhost. (subscription required (help)). ↑ Ma, Katy (10 October 2013). "What Is the International Day of the Girl Child?". The Huffington Post. Retrieved 11 October 2016. ↑ Ambrose, Rona and Rosemary McCarney (December 29, 2011). "International Day of the Girl Child: girls' rights are human rights". Edmonton Journal. Retrieved September 26, 2012. ↑ "Resolution Adopted by the General Assembly: 66/170 International Day of the Girl Child". United Nations. Retrieved September 26, 2012. ↑ "WHO | Ending child marriage". Who.int. 2012-10-11. Retrieved 2014-08-21. ↑ "Day of the Girl Child - Gender equality - UNICEF". UNICEF. 17 October 2014. Retrieved 2 December 2014. ↑ Higgins, Chris (11 October 2013). "6 Reasons Today is International Day of the Girl". Mental Floss. Retrieved 11 October 2016. ↑ Bhandary, Shreya (September 25, 2012). "'Because I am a Girl Rock Concert' to celebrate first ever 'International Day of the Girl Child'". Times of India. Retrieved September 26, 2012. ↑ "International Day of the Girl Child". Girl Guides Australia. Retrieved September 26, 2012. ↑ "South Africa: Women, Football and Song". All Africa (orig. in Daily Maverick). September 14, 2012. Retrieved September 26, 2012. ↑ Martinson, Jane (11 October 2013). "Body Gossip puts spotlight on models and body image". The Guardian. Retrieved 12 May 2016. ↑ Bent, Emily (2015). "Girls' Human Rights and Virtual Empowerment". In Smallwood, Carol. Women, Work, and the Web: How the Web Creates Entrepreneurial Opportunities. Rowman & Littlefield. p. 17. ISBN 9781442244276. ↑ Proudfoot, Jenny (11 October 2016). "Women of the World Celebrate the UN International Day of the Girl". Marie Claire. Retrieved 11 October 2016. ↑ "Presidential Proclamation -- International Day of the Girl, 2016". The White House. 7 October 2016. Retrieved 11 October 2016. ↑ Allen, Lasara Firefox (2016). Jailbreaking the Goddess: A Radical Revisioning of Feminist Spirtuality. Llewellyn Publications. ISBN 9780738748900.